John Ruth “The Hangman” (Kurt Russell) is a bounty hunter known for bringing in his bounties alive, regardless of the difficulty in doing so. 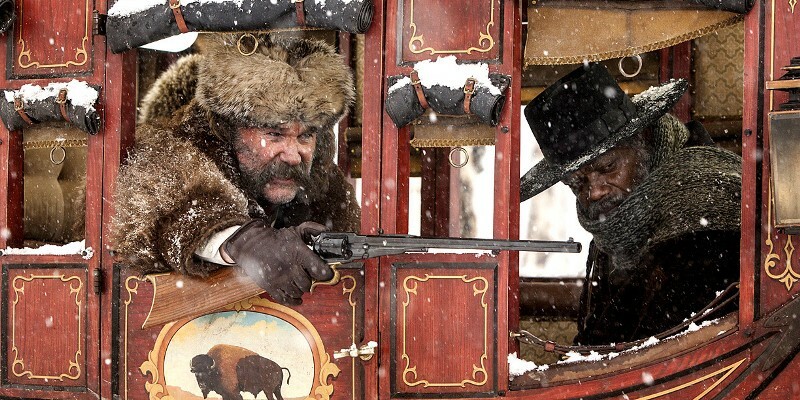 His latest conquest is Daisy Domergue (Jennifer Jason Leigh), but whilst transporting her by stagecoach through a brutal winter storm, he is forced to stop off at Minnie’s Haberdashery to wait out the blizzard. On his way there he picks up a fellow bounty hunter, Major Marquis Warren (Samuel L. Jackson) and the new sheriff of the town they’re heading for, Chris Mannix (Walton Goggins). Upon arriving at the haberdashery, Ruth and the others find Minnie nowhere to be found, and four strangers (Tim Roth, Michael Madsen, Demian Bichir and Bruce Dern) holding the fort instead. I didn’t get to see this in 70mm. I saw The Hateful Eight in the bog-standard whatever the heck format most movies are shown in (I don’t get bogged down in the technicalities of sitting in front of a movie screen). Had the 70mm been showing near me at a reasonable price then yes, I might have been persuaded to see it, but more for the experience of seeing something in a format I’ve not seen before, and also because I hear those screenings came with some pretty swish programmes. As it is standard format was fine by me, though I’ve got an issue with just how wide a frame Tarantino used to shoot this in. According to the undisputed fountain of all knowledge that is Wikipedia, 70mm film uses a wider-than-usual frame. Given how most modern cinema screens aren’t accustomed to this format, the wider the frame, the less we see of it, as the image size must be made smaller and smaller to fit it all in, leaving these huge swathes of darkness atop and below the image. Thanks Quentin, much appreciated. You go and use your fancy traditional techniques and essentially move the screen further away from my face. Of the Tarantino movies I’ve seen (I’ve not caught Jackie Brown yet, and have only seen the Kill Bills once apiece) Reservoir Dogs has always been my favourite. It was the first Tarantino I saw, and I appreciated the limited cast and scope, taking place around an event instead of during it and being almost entirely dialogue driven. I’ve liked everything else he has made, including the oft-maligned Death Proof, but Reservoir Dogs was always number one. So when The Hateful Eight was announced I awaited it upon tenterhooks, as this proved to be Reservoir Dogs in a western setting, with a bunch of grizzled old character actors holed up in one spot firing insults and shots at one another. Then QT went and made it three hours long, and we started to have some issues. You see, Dogs never outstayed it’s welcome. It’s a brisk 99 minutes long and, whilst it’s mostly set in the warehouse, there are dalliances and flashbacks elsewhere to break up that setting. 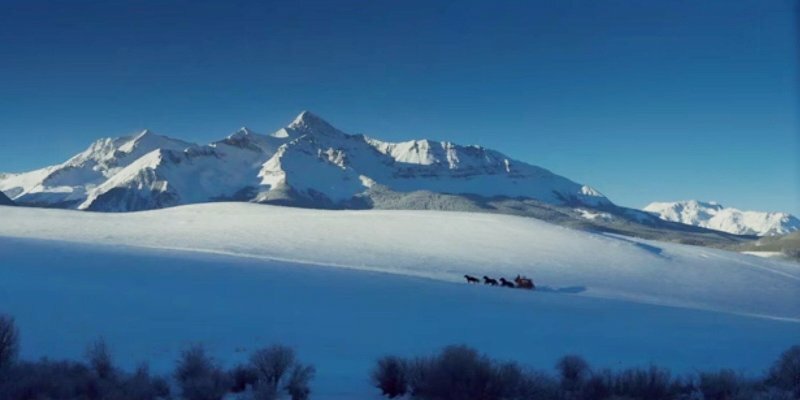 The Hateful Eight has an opening act on the way to the haberdashery, and the rest of it is all set in that one place. There are small fragments that break away, but not many. Limited settings and casts are fine, but not for three damn hours. There’s plenty that could have been cut, a couple of characters to start with. At least one of the four strangers waiting at the haberdashery adds nothing to the plot save another possible villain, and one fewer unknown would have been fine by me. Similarly, a fair amount of time is spent with Ruth’s driver O.B. (James Parks), who in my eyes has been given short shrift by not being included amongst the eponymous eight. If he’s not in the title, cut down his character. I can’t really see any reason why this had to be longer than maybe 145 minutes, if that. I don’t normally mind long films – in fact in the cinema I tend to prefer them, as I feel I get more value for money – but often I found my attention wandering. Speaking of the cast though, for the most part they’re fantastic. Kurt Russell is playing one of his gruff-yet-likeable salts, and seems to be having a fine old time. Jennifer Jason Leigh takes a bit of a beating, but is highly entertaining doing so and thoroughly deserving of her Best Supporting Actress nomination. I haven’t seen any of the other four nominations, but is Leigh wins I won’t be annoyed. I’m somewhat shocked that Sam Jackson hasn’t received much awards buzz for his role though. He is essentially the film’s lead, but should have been very worthy of Best Supporting Actor consideration. He gets easily the film’s most memorable monologue in the centre, kicking off the actions of the film’s second half, and has a great deal to do everywhere else too. Walton Goggins and Demian Bichir are a lot of fun too, but Michael Madsen and Bruce Dern feel like they’re treading lightly over familiar ground and Tim Roth is just plain not good. I feel like he walked in from a deleted scene from Adam Sandler’s The Ridiculous Six (which admittedly I’ve not seen and, given the reviews, don’t plan to). There’s enough here to make it worth watching, and to be honest overall I enjoyed myself courtesy of the better performances and the stand-out moments from the screenplay, but there are many areas of improvement. This sits above Death Proof in Tarantino’s filmography, but below everything else. If the man has just two directorial efforts left in him, let’s hope he edits them down a bit more before release. This entry was posted in 07/10, Choose Film, Film-Makers, New Release, Quentin Tarantino, Review, Unlisted and tagged Bruce Dern, Channing Tatum, Demian Bichir, Gene Jones, James Parks, Jennifer Jason Leigh, Kurt Russell, Michael Madsen, Quentin Tarantino, Samuel L. Jackson, The Hateful Eight, Tim Roth, Walton Goggins, Zoe Bell by jaycluitt. Bookmark the permalink. 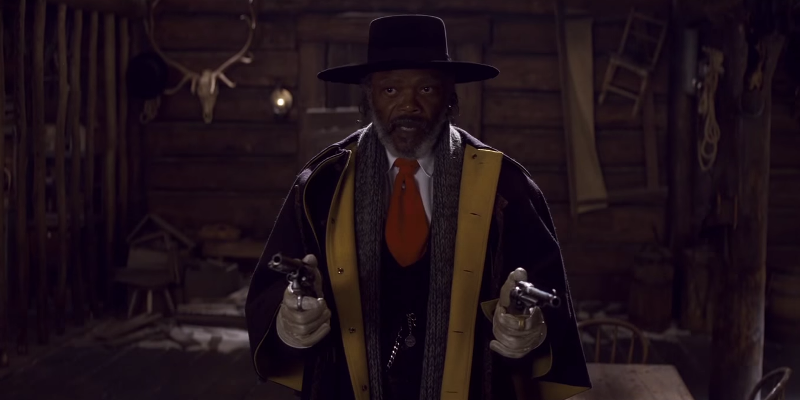 I think I pretty much had the exact same feelings about The Hateful Eight! I saw it an average Joe cinema screen and it was waaaay too long, I’m not surprised it’s going to be made into the play, the medium might be better for this kind of story. A play sounds like a good plan. I get the feeling this would have been a better viewing experience just to have had the interval in the middle that the 70mm screenings had. From what I’ve heard it works particularly well given its placement, just after Jackson’s monologue.